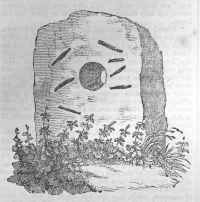 On a rocky eminence in the townland of Ballyvernish, about one mile from the village of Doagh, stands a large whinstone slab, called the Holestone. This stone is upwards of five feet in height above the ground, and near the base six feet eight inches in circumference, and ten inches in thickness. At about three feet from the ground there is a round hole perforated through it, sufficient to admit a common-sized hand; it has evidently been made by art, but there is neither record nor tradition respecting the purpose for which it was erected, nor by whom. About thirty years ago a man put his hand through the aperture of this stone, but was unable to extricate it; on which, those who were with him gave the alarm, and a crowd was soon collected, whose conflicting opinions only served to increase the fears of the person in limbo. Amongst those assembled, was a Mr. O----, a resident in the neighbourhood, who seeing so much needless alarm, determined to be a little waggish upon this occasion. "Fly," said he, to a bystander, "for my powder-horn, and I'll soon free him; I'll blow up the stone in an instant!" At these words, the confusion and alarm of the multitude beggars all description, while the cries of the prisoner, which had hitherto been sunk in the noise, became piercing in the extreme. During the confusion, the gentleman had sent off privately for some vinegar, and on the return of the messenger, with it, he began to pacify the prisoner, and to bathe his hand, which had become swelled in the various attempts made to get it extricated; and he at length succeeded in effecting his liberation, without application to the much dreaded powder horn. 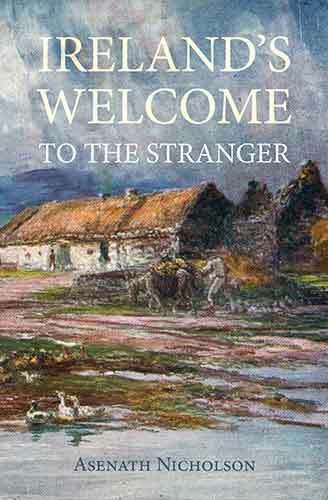 The writer is not aware of any similar stone at present in Ireland; but it is said that within memory, a large stone with a hole through it, stood on a hill, near Cushin-dall. 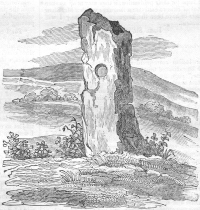 In Ross-shire, Scotland, there is a stone exactly resembling the above; and near Kirkwall, Orkney, at a place called Stennis, is a large stone standing with a hole through it, said to have been a Druid's altar. The place where it stands is still deemed a place consecrated to the meeting of lovers; and when they join hands through the stone, the pledge of love and truth there given is sacred, and rarely, if ever, has it been broken. Stones perforated in this manner are to be found in most parts of Ireland, and particularly in the burial grounds attached to very ancient churches. The annexed wood-cut represents one of them remaining in the church-yard of Castle Dermot, and which is inscribed with some ancient Ogham characters or letters, in use in Ireland previous to the introduction of Christianity. There is also a remarkable perforated stone of this description, inscribed also with Ogham characters, near the church of Killmelcheder, one mile from Smerwick harbour in the county of Kerry. They have, probably, an Eastern origin, for Mr. Wilford informs us, in the Asiatic Researches, vol vi. p. 502, that perforated stones are not uncommon in India; and devout people pass through them, when the opening will admit, in order to be regenerated. If the hole be too small, they put the hand or foot through it, and with a sufficient degree of faith, it answers nearly the same purpose.